Mark Zuckerberg is credited as founding Facebook in 2004​ when he launched a website called "thefacebook," which was designed for the exclusive use of Harvard students. The instant popularity of the website drove it to expand and become accessible to other universities, then high schools, and selected companies such as Microsoft and Apple. In 2006 Facebook became accessible to the entire world's population and by the end of the year,​ it had 12 million users. 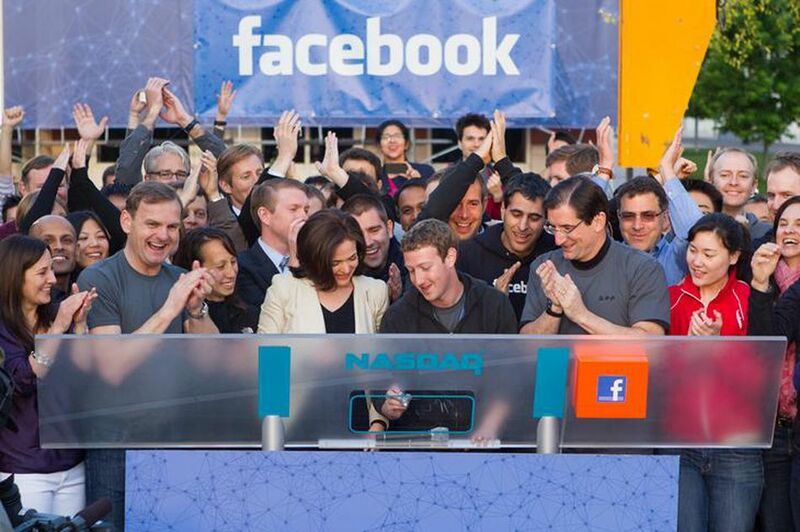 The Facebook corporate headquarters are located in Menlo Park, California. The international headquarters of Facebook are located in Dublin, Ireland. "Facebook's mission is to give people the power to share and make the world more open and connected." "People use Facebook to stay connected with friends and family, to discover what’s going on in the world, and to share and express what matters to them." Many people think that Zappos.com was founded by its current well-known leader Tony Hsieh, but that isn't the whole story. In 1999 Nick Swinmurn came up with the idea of selling shoes in an Internet store. Tony Hsieh then invested $500,000 in Nick's idea and the two founded and ran the company together, which was originally called ShoeSite.com. When Swinmurn left Hsieh completely in charge of the company in 2006, the annual sales were $252 million. Even though it serves customers in 40 countries, the world headquarters of Netflix remains in the U.s., and is located in Los Gatos, California. We promise our customers stellar service, our suppliers a valuable partner, our investors the prospects of sustained profitable growth, and our employees the allure of huge impact. IBM was first incorporated in New York state in 1911 as the Computing- Tabulating- recording Company (C-T-R) by Charles R. Flint as the merger of four companies - the Tabulating Machine Company, the International Time Recording Company, the Bundy Manufacturing Company, and the Computing Scale company. The C- T- R company initially sold a wide variety of machines including coffee grinders, and meat slicers, and it provided business services like census tabulation with punched card equipment. The company changed its name to International Business Machines Corporation in 1924 to better describe the company’s present and future business activities. Today the company refers to itself as IBM and provides a wide variety of technology, products, and services to business customers throughout the world. The IBM international corporate headquarters are located in Armonk, NY. Trust and personal responsibility in all relationships"
Best Buy was founded by Richard Schulze and his business partner in 1966. The first store opened in St. Paul, MN as the Sound of Music. Richfield, MN is currently the site of the Best Buy headquarters. "Our formula is simple: we’re a growth company focused on better solving the unmet needs of our customers—and we rely on our employees to solve those puzzles. Thanks for stopping." Although it is difficult for millions of people to remember what life was like without Google, the history of the Internet information services company only goes back to 1996 when founders Larry Page and Sergey Brin were graduate students at Stanford, and began working on a search engine together which they called “BackRub.” The name of the search engine was changed to “Google” in 1997, a name that was inspired by the mathematical term “googol,” which means the number one followed by 100 zeroes, which represented the infinite amount of information Page and Brin intended to organize. Google made its first $100,000 a month before there was an official company. Google filed its official incorporation papers on September 4, 1998. The first Google headquarters were located in a garage in Menlo Park, California. A staff of eight moved to Google’s first commercial office space in Palo Alto in 1999. The corporation headquarters of Google Inc. are not located in Mountain View, California and the campus is referred to as the Googleplex. Additionally, as of 2012, there were more than 70 international Google offices" located in more than 40 countries. Fast is better than slow. - We know your time is valuable, so when you’re seeking an answer on the web you want it right away–and we aim to please. Democracy on the web works. - Google search works because it relies on the millions of individuals posting links on websites to help determine which other sites offer content of value. The founder of eBay, Pierre Omidyar claims that first code that he wrote for what he thought could become a virtual global marketplace was an "experiment." But after he sold the first product over Labor Day weekend in 1995 - a broken laser pointer which sold for $14.83 - online using that code, his experiment became an e-commerce website that would eventually grow to be the world's largest Internet auction platform. But being the world's largest auction marketplace wasn't enough for the visionaries that have led eBay since 1995. The portfolio of virtual businesses which eBay owns and operates in order to enable entrepreneurship in a global virtual marketplace include PayPal, shopping.com, StubHub, and BillMeLater. The real world headquarters for the virtual business operations of the eBay corporation are located in San Jose, California. We provide a robust platform where merchants of all sizes can compete and win. We empower consumers to buy and sell anything, anytime, anywhere"
Employees Benefits at eBay Judged to Be “The Best"
Intel was founded in 1968 by Bob Noyce and Gordon Moore who both had previously worked for Fairchild Semiconductor. They named their company NM Electronics, and purchased the right to use the name “Intel” from Intelco later that year. The company’s first product, the 3101 Schottky bipolar random access memory (RAM), was produced in 1969. The Intel corporation became a publicly traded company in 1971. The headquarters of Intel corporation are located in the same city where their first office was opened - in Santa Clara, California. "Delight our customers, employees, and shareholders by relentlessly delivering the platform and technology advancements that become essential to the way we work and live." AT&T has its roots in the invention of the device that would change the communications history of modern man. After Alexander Graham Bell invented the telephone in 1876, his father-in-law, Gardiner Greene Hubbard, created the Bell Telephone Company and the New England Telephone and Telegraph Company. The Bell System became the monopoly for telephone communications in the U.S. In 1885 the American Telephone and Telegraph Company was formed as a subsidiary company to build and operate a long-distance network. The first long distance calling capability was established between New York and Philadelphia and the call capacity was originally just one long distance phone call at a time. The name of the American Telephone and Telegraph Company wasn’t officially changed to AT&T Corp. until 1994. In 1913 AT&T became a government-sanctioned monopoly. In 1982, an anti-trust lawsuit forced AT&T to divest itself of the Bell System for local calls. Twenty-three years later, that divested local telecommunications company SBC Communications acquired AT&T Corp., and long-distance and local telephone service was once again delivered by one company - AT&T. As of 2012, there are more than 16,000 AT&T retail outlets including more than 2,200 company-owned and operated stores, along with retail kiosks, authorized retail dealers, and third party retail locations. AT&T corporate headquarters are located in Dallas, Texas. "Today, our mission is to connect people with their world, everywhere they live and work, and do it better than anyone else. We're fulfilling this vision by creating new solutions for consumers and businesses and by driving innovation in the communications and entertainment industry." Our mission is to exploit technical innovations for the benefit of AT&T and its customers by implementing next-generation technologies and network advancements in AT&T's services and operations. The AT&T global network was born of the ingenuity of AT&T Labs networking specialists who made disparate systems work together. Being the world's fastest and most reliable global network, our network is the standard against which all others are measured. To maintain our leadership in this arena, we focus on the future and aggressively pursue innovations. Our vision is to design and create in this decade the new global network, processes, and service platforms that maximize automation, allowing for a reallocation of human resources to more complex and productive work." The Microsoft Company has its roots back in 1975 when Bill Gates and his partner Paul Allen sold their first computer software called Altair BASIC to MITS Creative Electronics Company in Albuquerque, New Mexico. Gates was 19 years old and Allen was 22. The first year’s revenue for Gates and Allen was about $16,000. The Microsoft name was first used in 1976 and the company was first incorporated in 1981. Microsoft corporate headquarters are located in Redmond, Washington. ”As a company, and as individuals, we value integrity, honesty, openness, personal excellence, constructive self-criticism, continual self-improvement, and mutual respect. We are committed to our customers and partners and have a passion for technology. We take on big challenges and pride ourselves on seeing them through. We hold ourselves accountable to our customers, shareholders, partners, and employees by honoring our commitments, providing results, and striving for the highest quality." GameStop began as Babbage's, which was a small software retailer founded in 1984 in Dallas, Texas. After a series of mergers with Funco, Inc. and Barnes & Noble, GameStop became its own company and an independent chain of retail stores in the year 2000. The GameStop headquarters are located in Grapevine, Texas. After David Cook sold his oil and gas software business, he used his technology know-how to open a video rental business in 1985 and Blockbuster Video was born. Blockbuster's headquarters are located in the city of the chain's first store, Dallas, Texas. "Our corporate mission is to provide our customers with the most convenient access to media entertainment, including movie and game entertainment delivered through multiple distribution channels such as our stores, by-mail, vending and kiosks, online and at home. We believe Blockbuster offers customers a value-prices entertainment experience, combining the broad product depth of a specialty retailer with local neighborhood convenience." Blockbuster's Troubles - What Would Bezos Do? As its name suggests, the original Radio Shack store was opened in 1921 by brothers Theodore and Milton Deutschmann in Boston, Massachusetts to provide products and parts to ham radio operators. The corporate headquarters of Radio Shack are located in Fort Worth, Texas. "Through convenient and comfortable neighborhood stores, knowledgeable sales associates help customers get the most out of their technology products." The first Office Depot store was opened in Fort Lauderdale, Florida in October 1986 by founders and partners Pat Sher, Jack Kopkin and Stephen Dougherty. The headquarters of Office Depot are located in Boca Raton, Florida, not far from where the first Office Depot store location. Circuit City was founded in 1949, and went bankrupt and liquidated in 2009. The Circuit City brand and logo were purchased by Systemax Inc., and currently, consumer electronics are being sold through a Circuit City-branded e-commerce website. The Systemax, Inc. headquarters are in Port Washington, NY. On its corporate website before the company went bankrupt and liquidated all of its brick-and-mortar stores, Circuit City outlined the mission statement that purportedly guided the company's decisions and actions. "To make sure that we are all working in the same direction, each of us must live and breathe Circuit City's values and use them as a guidepost for our actions and decisions." "Respect Our Associates are our greatest assets. We expect every Associate to demonstrate that they respect and value others for their efforts, their knowledge, and the diversity that they bring. We are a product of our experiences and those around us can benefit from our lessons learned. Pass on to others what you value and learn. What's in it for you? We foster an environment of engagement where associates are invested and involved in the future of the company. What you do matters. Use your fresh perspective to look, ask, and learn. We never stop looking at the way we approach our business and ways to simplify processes. We expect all of our associates to maintain the highest of ethical standards. Our integrity must never be compromised. Integrity is the foundation onto which all other values are placed." OfficeMax, Inc. was founded back in 1931 when it operated as the Boise Payette Lumber Company. After Boise Cascade Corporation acquired the company on December 9, 2003, the name was changed to OfficeMax, Inc. The headquarters of OfficeMax is located in Naperville, Illinois. Think Company & Customer First. Provide feedback to drive continued growth"